The easiest way for visitors to Newfoundland, Canada to spend some time iceberg watching, is to book a tour with Northland Discovery and climb aboard the Gaffer III. The boat tour will leave from St. Anthony, Newfoundland and make its way into Iceberg Alley where large icebergs float aimlessly around changing shape every day during this melting process. A woman aboard the boat takes some pictures of this massive iceberg which could send large ice chunks crashing into the waters of Iceberg Alley at any given time. This area is one of the best in Newfoundland to view icebergs with May to July being the best months. A picture makes it hard to explain what it is like to be this close to these natural phenomenons and the reality does not sink in until being aboard an iceberg watching boat tour. 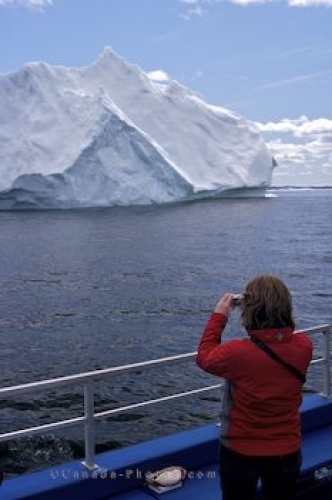 Picture of a woman on an iceberg watching boat tour in Iceberg Alley in Newfoundland. Tourist onboard the Gaffer III during an Iceberg Watching tour with Northland Discovery Boat Tours from St Anthony into Iceberg Alley, Viking Trail, Northern Peninsula, Great Northern Peninsula, Newfoundland, Canada. Model Released.